The best thing about 2010 is that it's over. It was a year filled with utter stupidity, mendacity, and greed beyond all bounds on the part of our rulers, also known as The Money Party. Lots of fiddling while Rome and the rest of the world burned. Knowledge is power and among the ruling elite in the United States, the power was off. Somebody forgot to pay the bill or paid with a bad check, no doubt. The "U6" unemployment figure is 17%, well above the official 9.8% we hear all the time. The official number accounts for 15 million citizens. But when we use U6, we add 9 million citizens forced by economic conditions to work less than they want in part time jobs and 2.5 million marginally attached to the work force - those who gave up looking and get no benefits. That gives us a real world total of 26.5 million citizens out of work or working part time against their will. 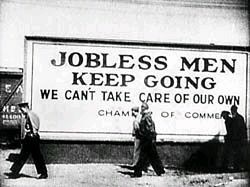 Using more refined, politically neutral measures (closer to those in the Great Depression), the over all unemployment percentage is 22.5%, a total of 34.6 million citizens without employment. 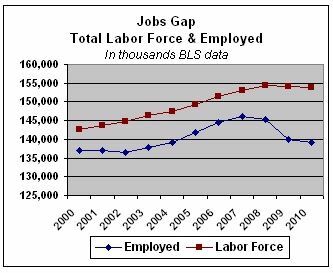 Shadow Government Statistics calculates the real unemployment rate by adding in "long term discouraged workers" (those who stopped looking), a measure the government no longer uses. If people don't have jobs they suffer more, have less advantages to offer their children, and drift quickly into poverty. They face homelessness and risk falling so far behind they'll never recover. Thanks to the dreadful members Congress who voted for the new bankruptcy bill in 2007, those unemployed will always have their medical bills to pay. Thoughtful bunch. The Response - Crackpot Economics You'd think that the government would have the most able hands on deck for this economic storm. But we've got the same old crew, dominated by Wall Street insiders and big bankers without credibility. These are the folks creating MPD (multiple personality disorder) economics. They argue that we have to focus on the deficit and get that down (even that policy was disastrous in the Great Depression). Then they argue that we need to give away $900 billion in tax revenues so the top 1% will have enough wealth to trickle down on the rest of us. They can't have it both ways. Lowering the deficit while lowering income at the same time is simply absurd logic. They think nobody is paying attention. It's important to know that the people behind these policies know exactly what they're doing. They just think we're stupid, a fatal error. The key players now include Obama, the Bush Clan, Bill Clinton, and the usual suspects from Wall Street and the big banks. They have their own media monopoly to crank out the nonsense. The Fed is doing its part with Quantitative Easing 2 which, as Numerian says, "" is experimental and unprecedented, except when it was used in Weimar Germany with disastrous results, or more recently in the hyperinflationary economy of Zimbabwe." Other Major Failings We got health care reform but Congress forgot to do anything for the people. The elimination of "preexisting conditions" as a means to open up more coverage for adults was postponed until 2014. The self-employed are totally screwed with their rates doubling and tripling in some cases. And there was no action to curb the outrageous cost of pharmaceuticals thanks to a major cave in by the president. Medicare, for example, is barred by law from negotiating discounts from big pharma. That about sums it up. The only reform was a massive bailout for the health insurance companies. Nothing has been done to address the rapid increase in citizens in poverty. That would require jobs. The only jobs those in power produce are for themselves and their cronies. The Gulf of Mexico was polluted by the worst oil company by a long shot, BP. The president surrendered national sovereignty over the 200 mile off shore exclusive economic zone by allowing BP to run the cleanup. That included permission for the use of a highly toxic oil dispersant, one that they knew toxic. But it did the job required. It kept the evidence off the surface. Shame about the rest of the Gulf. They don't care. They don't have to. Presidential Hit Squads This year saw a radical shift in power from everyone else to the White House. The president's national security advisor revealed that the White House had a hit list of US citizens abroad determined to be terrorists. Never mind the time honored process of arrest, indictment, trial, and sentencing. If some bureaucrat nominates a "bad guy," he's toast. Shame if that turns out to be one of us. There's no reason this needs to be limited to citizens overseas since it's the ultimate in lawlessness from the start. Piss off the wrong person and you're in the cross hairs. The United States still occupies Iraq and Afghanistan. While China offers to invest in a top to bottom railroad system from China to the warm water port at Karachi to distribute their goods, US predator drones bomb villages killing ordinary citizens along with whomever they're after. 800 military bases worldwide spread ill will. As economist Michael Hudson points out about the BRIC countries (Brazil, Russia, India, and China): "When they say we don't want to hold dollars, by that they mean, we don't want to finance our military encirclement, which is what the dollar standard has financed." The Good News The best news out of 2010 is that the forces in control, The Money Party, have been unable to crush the will of the people to survive and see future opportunities for improvement. All over the country families are helping each other weather the storm, parents and adult children are opening up their homes to others in need, adjusting their retirement plans, taking extra jobs, and working harder to stay afloat. Ad hoc communities of care and compassion are emerging to buck the tide of government indifference, malfeasance, and fraud. The United States has an inverted pyramid of intelligence. The vast majority have far greater talents, knowledge, and wisdom than the ruling elite, who have failed miserably at every turn over the past year and decade, for that matter. The goal is to wrench power from the fumblers before they do totally irreparable damage. Perhaps those in the under thirty generation are the key. They were told to work hard, go to school, and acquire skills. They were also sold on the magic of the stock market. All they've seen over the past decade is a flat job market, stock manipulations, wasteful wars, and hysteria about terror - all at the expense of rebuilding the nation's infrastructure (which would spark a real recovery) and producing work worthy of a people who want the best for their families, friends, and the country. Happy New Year. Time to throw the bums out.